Chromebooks were a much sought-after device over Christmas. Stats published earlier today by analytics company NetApplications suggests that Google's operating system, Chrome OS, might have a bumper month thanks possibly to Christmas sales. Data compiled for the month of December 2014 shows that Windows 7, Windows 8 and Windows 8.1 suffered significant dips while Windows XP and OSes classified as "Other" have increased significantly. 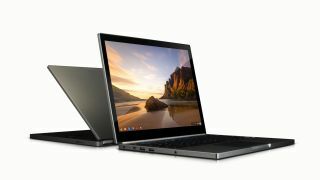 "Other", which almost certainly includes Chrome OS, saw its market share more than double from 8.56% to 17.52% in a month; in comparison, Windows 8.1 and Windows 8 have less than 12% of the global desktop OS market. Chrome OS's surge may also explain a massive jump in desktop browser market share in December 2014 for Google's browser. Chrome more than doubled its market share, overtaking Internet Explorer for the first time in NetApplications' surveys. Chromebooks have been a popular gift at Christmas, occupying three out of the five top gift ideas at Amazon US. We've reached out to Netmarketshare to find out more about the data published.